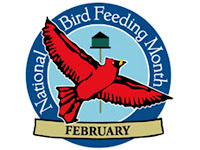 February was established as the National Bird Feeding Month because it's one of the most difficult months in much of the U.S. for birds to survive in the wild. Consider that the average wild bird weighs less than two nickels and you’ll realize that the winter can be a very punishing time for your backyard friends. 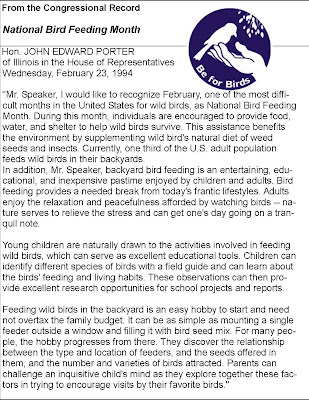 The resolution noted that one-third of the adult population feeds wild birds in their backyards. Wild Birds Unlimited encourages people to make winter a little easier for wild birds by providing food, water, and shelter. Backyard bird feeding is an entertaining and educational pastime that can be enjoyed by children and adults. It provides a needed stress relief and brings families together. Feeding wild birds in the backyard is an easy hobby to start, and can be as simple as watching a feeder that sticks to the window. For many people, the hobby progresses from there. They discover the relationship between the type and location of feeders, and the seed offered in them, and the number and varieties of birds attracted. If you offer water you may attract birds that do not visit feeders. Using a heated birdbath or adding a bird bath warmer to keep the water from freezing in Michigan during winter creates an oasis for birds. To round out the family's backyard birding program, birdhouses can be purchased or built. Also known as nest boxes, these can provide shelter in winter and breeding sanctuaries during spring for cavity-nesting birds. Feeding backyard songbirds is the most popular wildlife-related recreational activity around the home. A stress-free activity, it brings a welcome flash of color, dash of motion and splash of sound into the backyard, particularly during long Michigan winters.